I wrote a while back about the schedule I created for our family. While it’s been tweaked a bit as we have tested it out, it’s proven useful for getting the important things done as long as I practice using it. 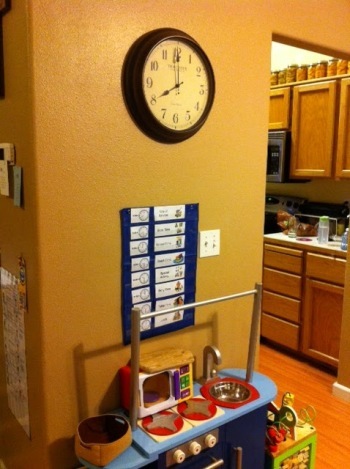 I’ve also created a visual schedule for the kids so that they know what to expect during the day. 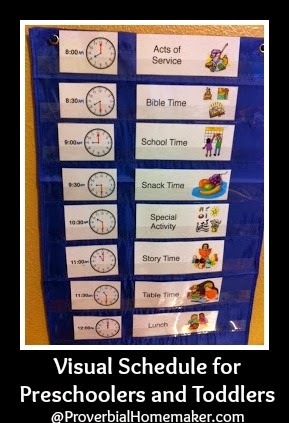 I used a pocket chart from Target and printed out activity cards and time cards (free printable). I can rearrange things as needed, but they stay basically in the order shown above. On Wednesdays, we go to BSF right after Acts of Service. So I replace all those cards with one Bible School card. On Fridays, we normally go to Co-op after snack time. I found the activity card ideas and images from the Classroom Center Signs section of The Daycare Resource Connection. I took the clock images from a place like Homeschool Math and just drew in the hands where I wanted them. The times aren’t meant to be too rigid. We generally follow the schedule. The kids enjoy knowing what’s next, and boy do they call me on it if I miss something! 🙂 The times are more for my own reference. All in all, it’s proven a helpful tool at in our home! Hi Tauna! I love your idea of a schedule. I think that since I’ve had so much trouble with my 3 year old and I think a visual schedule is a great solution for both of us. Thanks for the printables too! You’re very welcome Shonda! Glad you can find them useful! Tauna I am so excited to find your blog. I am a 23 year old wife of almost 5 years amd have a 9 month old darling daughter. We also attend BSF its my first year and I just love it! 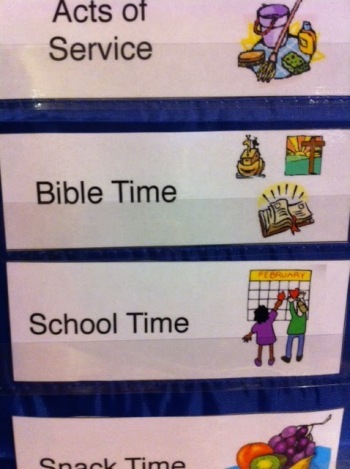 I love your schedule, what a great idea to have it visible for the kids to see. I am going to see what I can come up with as I have no where to get a pocket chart around here. I love the look of that though. Thanks for sharing with Throwback Thursday Blog-Style. I can’t wait to see what you share this week.